The RYA is the national body in the United Kingdowm for all forms of boating, including dinghy and yacht racing, motor and sail cruising, RIBs and sports boats, powerboat racing, windsurfing, inland cruising and narrowboats, and personal watercraft. The RYANI are their Northern Irish branch. Lough Foyle Yacht Club is situated on the banks of the River Foyle at Culmore Point, approximately 3 miles north of the Foyle Bridge. East Down Yacht Club (EDYC) has extensive facilities for both cruising and racing. It is located on the western shores of Strangford Lough, Co Down, Northern Ireland. The Club is situated on a 9-acre site, which includes a modern clubhouse, car parking, a boat-park, caravan and camping park, pontoons and slipways. Support services and amenities are available in the near by town of Killyleagh, only one mile from the Club. The barbecue and picnic areas provide additional space for relaxed hospitality (weather permitting). The upstairs function room and well stocked bar encourages a relaxed comfortable atmosphere. For the chocoholics, a tuck shop is available. East Down Yacht Club is mainly a self help club. Members are expected to assist with the running of the Club. To this end, rotas for race duties are published by the Sailing Captain and for bar duties by the House Captain. From time to time, work parties are arranged and members are requested to report to the Site captain for about two hours of work. Craigavon Lakes Sailing Club was formed in 2003 to promote the enjoyment of sailing and to enable members to improve their sailing skills and work towards further RYA qualifications. The club is based at the Craigavon Watersports Centre. The club has access to the full range of dinghies that are available at the Watersports Centre. These include Pico, Laser, Laser 2000, Laser Stratos and RS Feva. Open March-December, the club currently meets on a weekly basis, usually between 13.00hrs and 16.00hrs on Sunday afternoons (see Diary for sailing dates). New members, both new to sailing and experienced sailors are always welcome (see Visitors page for further information). 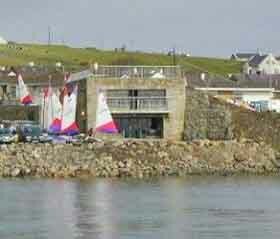 Mullaghmore Sailing Club began in 1963 and ran mainly as a dinghy and cruiser club under the guidance of a founder member, the late Joan Malone's husband Paddy Malone. In terms of the Yacht and Sailing Club, we are a relatively new club. Initially MSC was composed largely of members from outside the area. However, in the seventies and eighties, there had been a subtle change in the sport of sailing which encouraged the sport to embrace all. This was reflected in a change of the clubs’ name from the old Mullaghmore Yacht Club to Mullaghmore Sailing Club. Simultaneously membership increased, a new Clubhouse was built (1999) and an emphasis was placed on Junior Sailing and Special Needs Sailing with a view to building up a broad youth base to enable the future development of MSC. The last fifteen years has seen the club grow from its hedge school in the old pioneering days operating in the open at the north slip in the harbour to our clubhouse with its excellent facilities. Membership is healthy. Many of our youth and junior sailors have enjoyed and still are participating in and enjoying the varied challenges of the sport. Adults who have not sailed before are taking to the water on our evening courses for adults. The biggest event MSC hosts is the Mullaghmore Triathlon which now firmly established on the Triathlon circuit. Started in 2001 it is now a big event which draws hundreds of competitors and spectators in June each year. All income for the club's activities is re-invested in training and water sport events, a commitment that is specified in the articles of association of the club. Each year, in conjunction with the Sligo VEC, MSC runs up to six weeks of junior sail training courses for 30 to 40 young people each day over this period. MSC also runs sailing and navigation training for adults, major provincial and national sailing events and power boat courses. As a Recognised Training Establishment (RTE) all its courses and activities are certified under the Irish Sailing Organisation (ISA). The club is also committed to including people with special needs on sailing courses and have through the Peace and Reconciliation fund have invested in specially adapted access boats. New club facilities opened April 2000. Active dinghy sailing and racing in sheltered waters from April to October. Visitor moorings available for cruisers. Annual Cruiser Regatta held at the end of July. The Fireball is a high performance two-person sailing dinghy offering exciting sailing, intense competition and a great social life off the water. For all the latest Fireball news click here. The thrills of trapeze and spinnakers are hard to match in any type of sailboat or board and neither age nor gender determines your ability to be competitive. Fireballers sail all year round – during the Winter at the DMYC Frostbites in Dun Laoghaire and the during Summer at many events around the country and the DBSC Tuesdays and Saturdays again in Dun Laoghaire. In addition there are active fleets in Clontarf, Killaloe and Dunmore East. If you would like to sail then get in touch with one of the following people who will help you find a spot! "The Fireball has been written off so many times yet consistently defies all obituaries. In fact, it has grown slightly over the years to provide a national fleet in the region of 70 boats at 15 venues which tends to substantiate its claim of being one of the leading dinghy classes in the country. Twenty-eight boats at the Nationals in Westport was a little down on the previous year but entries in the mid-20s for the other regional events would be considered more than satisfactory by a lot of other classes in this day and age. Noel Butler and Seamus Moore of DMYC retained their national title in Mayo, won the Ulsters in Carlingford and also won the Traveller’s Trophy for consistency of results. Fifteenth overall in the 68-boat World Championships in Thailand was a highly creditable finish for the Dun Laoghaire duo. Another Dun Laoghaire crew, Kenneth Rumball and Dave Moran, had a seventh overall at the Europeans in Belgium while, at home, Andy Pearce and Francis Rowan of the National YC won the Leinsters in Mullingar and the Skerries helm Simon McGrotty notched wins in the Munsters and Open Championships with two different crew. National Champions: Noel Butler and Seamus Moore, DMYC."